Posted on Fri, Feb 10, 2012 : 6:59 a.m.
Update: As of 9:45 a.m., the freeway lane had been reopened. State Police said no one was injured. The fire started when a hub bearing overheated, police said. The Washtenaw County Sheriff's Office was advising motorists to avoid eastbound M-14 between the two intersections with US-23 on the north side of Ann Arbor Friday morning. A semi tractor-trailer fire has closed the right lane, the office said in a meesage sent about 6:45 a.m.
A Google traffic map showed a severe traffic backup on M-14 and traffic backed up on southbound US-23 north of the intersection with M-14. A dispatcher said firefighters and Michigan State Police are on the scene. 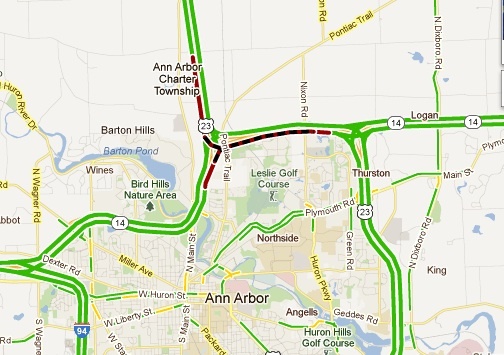 Traffic backups are shown in red and black on the map. Fri, Feb 10, 2012 : 3:20 p.m. I hate to sound macabre...but are there any pictures? I went around this mess via N Territorial. Since the article say's nothing about victims or injuries, please don't ding me.